image size 17½" x 12½", overall size 20" x 16"
The Chinook is truly a military workhorse with a lifting capability consistent with the arduous requirements of the Army in action. I have chosen to depict the unit in a desert scenario, revealing just enough of the airframe to instantly distinguish the type. 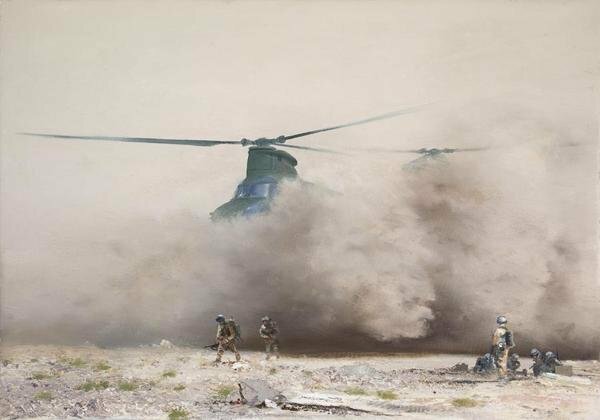 This would of course be a truly credible composition for a painting as the Chinook would kick up an awful lot of sand and dust. This is just up my street though as an artist. I feel it captures the essence of movement, sound and drama, making it a very exciting canvas to paint.